I have yet to get to the worm in one sitting.. I got this . . .
Ok I’m primarily a bourbon guy. Y’all know I like my Knob Creek. And I still drink a lot of Woodford plus the bottle of jack. So I’m wanting get a very good single malt without breaking the bank. By that I mean for me getting into keeping s couple bottles and consuming I’m saying let’s stay under 200 a bottle 150 even better. There are some of you who are more familiar with these offerings who may get just as good a scotch for far less. Sorry about that . . . Introductory Single Malts? Glendronach 12 YO is a very nice, easy drinking Scotch. Fruity in the way that Bourbon is "sweet". Bowmore 12 YO is an Islay Malt, so there will be Peat. But it is a LOT less peaty than the more noted Distilleries. Tomintoul's 16 YO offering is also a very nice "starter" Scotch. None of these will break your bank, and all of them have different characteristics to help you see what you like. The Bowmore would be a great way to see if you want to head further onto Islay and try out some of the more peaty offerings there. If I had to recommend ONE bottle, it would be the Glendronach. I was into some Turkey 101 yesterday. Forgot how good that chit is for the price you pay. 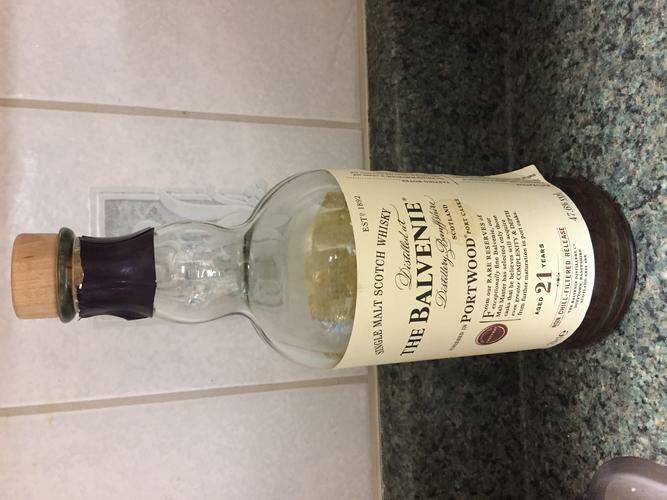 Had some balvenie 21 year portwood today. ScoutHikerDad and HARRYWALLY like this.